About our "Rufus".... He's a total joy and wonder! We love him to pieces, and he is deservedly spoiled rotten! He is now over 80 pounds at just 11 months old. We could not have asked for a better friend. Everyone comments on how beautiful he is and what a wonderful temperament he has. Even our vet continues to comment on his good nature, beautiful color, and excellent breeding. Actually, Rufus is somewhat of a celebrity around our neighborhood…every time we take him on a walk, all the neighborhood kids come running after us to pet him and rub his belly--or our neighbors want to let their dogs out so they can play with our Rufus. He definitely loves all people and other dogs! Rufus has a magnificent character. By nature he is snuggly, lovable, and playful; however, he can also be protective when you need him to be. He's brought joy, laughter, astonishment and pride to our household. We cannot imagine life without him. 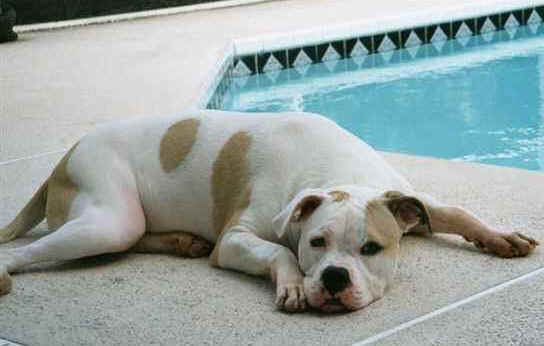 He's a wonderful, spirited dog with an intelligent mind, strong body, and gentle soul. We are proud to call him "ours." 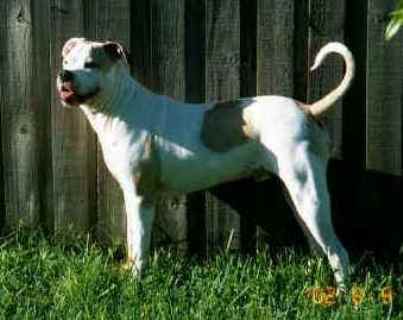 For anyone interested in an American Bulldog, you can’t find a better breed of American Bulldogs than Laura Kennels. From our very first contact with Laura Kennels, we were sold on their professionalism and love for the breed. Lynn took the time to get to know us and find out exactly the type of dog we were looking for. She wanted to make sure we received a pup that would fit our lifestyle. 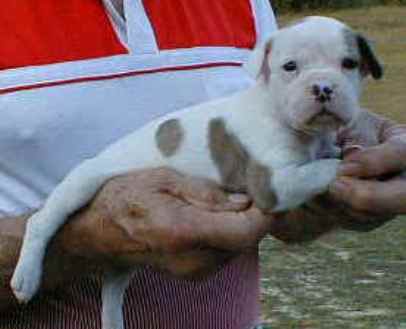 When we arrived at Laura Kennels in November of 2001 to pick out our pup from Josh/Possum’s litter, Lynn greeted us with a great big hug and smile. She introduced us to the family, gave us a tour of the kennel and other dogs, and then showed us the pups. She explained a little bit about each one and then sat back and allowed us time to play with the pups to decide which one we wanted. While she already knew exactly which pup she wanted us to have (based on our earlier conversations, preferences, lifestyle, etc. ), she wanted to see if we would come to the same decision on our own. Sure enough, we all had decided on Rufus! Thankfully, our relationship with Laura Kennels did not end at the purchase of Rufus. As issues come up in raising him, Lynn has been wonderful, answering all our questions promptly and offering her support. We are enclosing a picture of Rufus taken at a few weeks old (still at Laura Kennels), and 3 photos of Rufus at 10 months (70+ lbs.). Please feel free to contact us or use us as a referral at any time.